Pass it to Bulis: Keeping Track of Puck Battles: Can Puck-Strength Be Quantified? Keeping Track of Puck Battles: Can Puck-Strength Be Quantified? 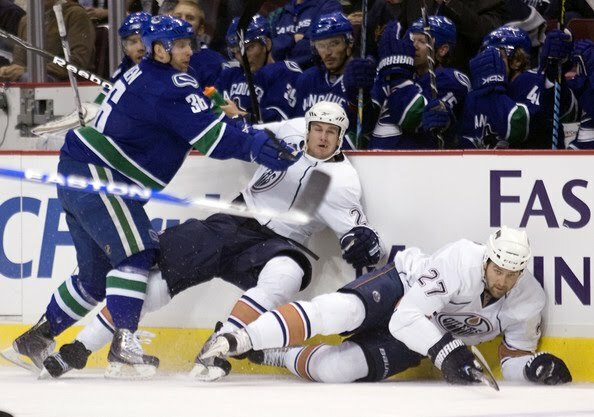 I think Jannik Hansen wins puck battles, but I don't know if I can prove it. Tuesday morning on the Team 1040, Scotty Rintoul and Ray Ferraro held their regular weekly interview with Mike Gillis. These interviews tend to range in their entertainment value, depending on whether Gillis feels like needling Scotty for the inanity of his questions or not, but there was one particularly interesting moment. Because Gillis attended the Moose/Heat game on Saturday, he was asked about what he looks for in a young prospect in terms of bringing them up to the NHL. He didn't hesitate to answer1: "the one most telling test is their puck-strength and their ability to win puck battles...that's what really separates guys from the American League and the NHL." He talked about strength in protecting the puck and winning puck battles as being the number one thing he looks for on the ice. Not skating, not shooting, not defensive positioning, not stickhandling - puck-strength. I was intrigued by this, as puck-strength is one of those qualities of a player that seems to defy quantification: there are no statistics that track how strong a player is on a puck, yet it is one of the foundational abilities that leads to success at the NHL level. It's also one of the most easily discernible differences between a rookie and a veteran in the NHL: rookies tend to be knocked off the puck easily and lose puck battles along the boards, while veterans do not. They've got old-man strength. I'd like to look at the one particular area of puck-strength that Mike Gillis mentioned: winning puck battles. Earlier this month, Justin Bourne wrote an article on Hockey Primetime on the topic of puck battles, stating that they are "hockey's most underrated non-statistic," and identifying some of the abilities that help win puck battles. He talked about turning 50/50 pucks into 60/40 pucks, the tiny difference leading to tremendous success. Unfortunately, there currently is no statistic keeping track of puck battles won--at least no statistic that is publicly available. I have a hunch that savvy coaches and general managers do keep track of this, or at least try to, though coaches may simply rely on their impressions in the moment. It's easy to watch a game and get frustrated with a player who seems to consistently lose puck battles and it's clear that Mike Gillis watches games with an eye for puck-strength and who wins those battles. It's unclear, however, whether anyone in the organization is actively tracking won and lost puck battles. Instead, statisticians are far more concerned with keeping track of results: shots, goals, assists, etc. or, if they are especially keen, missed shots, blocked shots, and points in relation to time-on-ice, teammates, and opponents. The issue is that many of these statistics are the result of winning puck battles. A statistic that purports to measure puck possession, such as Corsi, is profoundly influenced by consistently winning puck battles. Is there a way to get to the source and quantify puck battles with a statistic? On the surface, the task seems easy enough. Statistics are already kept for faceoffs, which are just a particular breed of puck battle. It's simple: the team that gains possession off the faceoff has won the faceoff. The issue is one of identification. Identifying a faceoff is easy: the play has stopped and the linesman drops the puck to re-start play. There are two clear players involved who oppose each other: the winner of the faceoff is the one whose team gains possession, even if his teammates played a key role in gaining that possession. There is a clear beginning to a faceoff and a somewhat muddled, but still identifiable, ending. Identifying a puck battle is far more difficult. When does a puck battle begin? When does it end? It's a problem of segmentation, which is a common problem for hockey statistics. Baseball, which easily has the most advanced statistical analysis in sports, is easily segmented. Every pitch is a separate event that can be analysed relatively easily. Each pitch has a distinct result that can be further segmented: if the batter reaches base, it could be from a hit, error, walk, or other circumstance that can be quantified. In hockey, the continuous flow of play resists segmentation: there is no distinct beginning or ending to any given event. Has a puck battle begun when two players meet with the puck on one of their sticks? Then a hit is a type of puck battle, which seems counter-intuitive. Perhaps a puck battle can be defined as when more than one player has the puck on their stick at the same time or within a given timeframe, but this is also not without its difficulties. If the problem of identifying when a puck battle has begun can be solved, the measurement of winning and losing said puck battle seems to be simple, as it can be measured in a similar fashion to faceoff wins and losses. There are, however, further difficulties. For instance, what about players who win a puck battle when the odds are stacked in their favour, such as when they begin with possession of the puck? What about players who lose a puck battle under the same circumstances? Furthermore, which players are involved? Teams with excellent puck support can swing puck battles in their favour simply by having more players involved. Can that be measured? Is it fair to say a player lost a puck battle when the opposing team had two players involved? Would it be possible to measure such a statistic on an individual basis or only as a team? Indeed, given the wide variance in how seemingly simple statistics such as hits and blocked shots are counted in different arenas in the NHL, it may be a hopeless task to expect a more nebulous event like a puck battle to be counted accurately. But I am willing to bet that a GM like Mike Gillis would appreciate knowing who wins the most puck battles, especially when it comes time to re-sign pending free agents2. For instance, both Kevin Bieksa and Christian Ehrhoff are set to be UFAs following this season. The consensus amongst the majority of Canucks fans is that Ehrhoff needs to be re-signed, while Bieksa can be traded this season with little damage done to the on-ice performance of the Canucks as a whole. Hypothetically, if a statistician could show that Bieksa consistently wins more puck battles than Ehrhoff, this could play a huge role in deciding who stays and who goes. Is a won puck battle as important as a hit or a takeaway? More important? Can it be quantified as equivalent to a certain percentage of a goal? I am not sure of what work is being done in this area of hockey statistics and must admit to a certain deficiency in myself in that I am not a statistician. However, Elliotte Friedman indicated in a recent 30 Thoughts that the late Pat Burns was angriest when players lost puck battles and that Craig Ramsay, the current head coach of the Atlanta Thrashers, does indeed keep a "battles won" statistic3. Has he solved the issue of identification of what is and is not a puck battle? Are any other hockey statisticians, coaches, or general managers doing any work in this area? Or will this very important facet of hockey remain in the realm of qualia, remaining a subjective judgement? To be quite honest, I do not know. I am just beginning to ask the question. 1. The question and response starts at 11:43 in the linked podcast. 2. Which would fit neatly into Gillis's oft-cited Moneyball philosophy. If winning puck battles is a huge part of winning hockey games, analogous to on-base percentage in baseball, and winning puck-battles is undervalued by the market, the Canucks could gain a huge advantage in paying less money for players who play a large part in winning games but do not have gaudy traditional statistics, and avoid paying big money to players who have decent counting statistics but consistently fall short in those areas that win games. 3. Massive hat-tip to @ArtemChubarov who reminded me in the comments section of this fantastic tidbit from Elliotte Friedman. I feel foolish for having forgotten it in the first place. to quote Friedman: "Brian Gionta said Burns was angriest when players lost battles. That's similar to a couple of coaches who are trying to revive struggling franchises. Scott Arniel, doing a great early job in Columbus, is, from what I'm told, very much like that. And Craig Ramsay keeps a "battles won" statistic in Atlanta." So yes, apparently some organizations do indeed track it! Bingo! That's what I was looking for. I feel foolish: I remember reading that exact article last week and couldn't remember exactly what was said or where I had read it. Thanks! I believe I shall edit that into the original post. i was going to ask if you've been reading moneyball again and then there you go and cite it at the end. interesting. I actually haven't read it in a while, but the basic principle is pretty simple. Find something that leads to wins that is undervalued by the market and exploit it. No need to feel foolish, easy to forget a single thought (from a pool of 30, no less) - from a column from last week! I only recalled that detail because I'd used the 20th thought from that column (about how Ladd + Bfuglein used to jam their sticks under Luu's pads) earlier today to prove that the Blackhawks Cup team played dirty! Interesting that Gillis mentions it, and that Scott Arniel is one of the two coaches mentioned that is apparently tracking this stat (do you think they might know each other?)... I like the "moneyball" angle on it - could really gain an advantage there if you could properly quantify it. I'd say we should track this ourselves, but whenever I try to do anything WHILE watching hockey, I find myself getting less hockey than my body needs. Exactly. When I watch hockey, I watch hockey. I find it nearly impossible to remove myself from the overall experience in order to track one specific element of the whole. That's like taking all of the ingredients for chocolate chip cookies and eating the flour. You don't eat a little flour between meals? Live a little. Well, while it's hard to define, there are specific puck battles that are easier to define. Just like you mentioned the faceoff, I'd like to keep track of every time the puck is dumped in or rebounds or somehow winds up along the boards, and who gets it. While the last team to touch the puck technically has possession, a missed shot that ricochets to the half-boards isn't really in anyone's possession anymore. Those situations often end in puck battles where two, three or four players have their sticks among their skates trying to free the puck. It seems like it'd be easy enough to track the players in those groups, and who winds up with the puck after. You should throw this up on Behind the Net on SBN. I tried to find the link to this particular article, but the http stymied me every time. @nanodummy You are approximately 2 days too late! Perhaps I should have fanposted it instead of fanshotting it, as it got approximately no attention whatsoever from the BTN guys. It's already being tracked by many (most?) teams. Nice link, thanks Coach. The second chart that tracks touches not just by positive, negative, or neutral, but also by what type of touch it is looks incredibly interesting. There's a lot of potential there.